When you have suspended solids, such as cement, coal, or fly ash, mixed with a liquid (such as water), a mud-like substance referred to as a “slurry” is formed. Measuring flow of slurries is often times challenging because of their abrasive nature and the wear and tear flowmeters experience. Add to the challenge a carrier fluid that is highly caustic or acidic, and the flow measurement task becomes geometrically more difficult. In certain industries this situation is very common. Slurry processing applications in mining, dredging, pulp & paper, fracking, oil and gas exploration (drilling slurries - not the old or gas), and wastewater treatment all have areas that present a variety of highly erosive and corrosive slurries. In these situations off-the-shelf magnetic flowmeters won’t last, so consideration must be given to custom flowmeters built specifically to withstand the application’s unique requirements. A complete understanding of the composition of the chemical and particulate nature of the slurry and the flow conditions is critical. Dredging is an example of challenging slurry flow measurement. 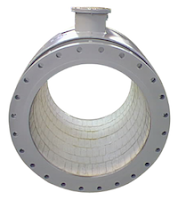 Customized magnetic flowmeters with very high erosion and abrasion resistance incorporate specialized materials and unique features that increase the performance and service life for that application. These flowmeters are highly engineered and the selection of a manufacturer with the experience, production capability, and quality control is imperative. In summary, when faced with measuring the flow of a highly erosive and abrasive slurry, it’s best to call upon a company with the expertise and production capabilities to match the flowmeter design exactly with the application requirements. Take the time to do this up front, and resist the temptation to “wing-it” with and install a generically designed flowmeter. Doing so will pay off in service life and overall cost in the long run.